The “Semantic Mirrors Method” (Dyvik, 1998) is a means for automatic derivation of thesaurus entries from a word-aligned parallel corpus. The method is based on the construction of lattices of linguistic features. 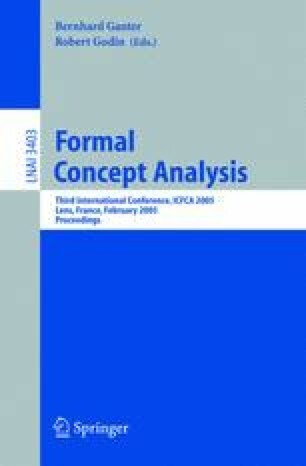 This paper models the Semantic Mirrors Method with Formal Concept Analysis. It is argued that the method becomes simpler to understand with the help of FCA. This paper then investigates to what extent the Semantic Mirrors Method is applicable if the linguistic resource is not a high quality parallel corpus but, instead, a medium quality bilingual dictionary. This is a relevant question because medium quality bilingual dictionaries are freely available whereas high quality parallel corpora are expensive and difficult to obtain. The analysis shows that by themselves, bilingual dictionaries are not as suitable for the Semantic Mirrors Method but that this can be improved by applying conceptual exploration. The combined method of conceptual exploration and Semantic Mirrors provides a useful toolkit specifically for smaller size bilingual resources, such as ontologies and classification systems. The last section of this paper suggests that such applications are of interest in the area of ontology engineering.